Home/News & Features/Social Media News/Google/Do you think Google is filtering your business in the local search engine results? Have you recently noticed a shift in the local search results of Google? If yes, then it’s not just you as there are many others who have seen the same thing. 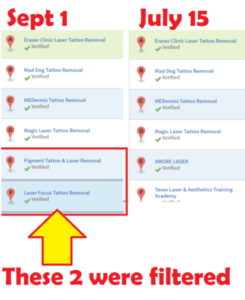 There is a recent refresh to the local ranking filter of Google and this is what is filtering your business in search results. It is apparent enough that Google has its own filter for local search which sieves through the listings which should appear in the 3-pack on Google and also in the Local Finder. Then this filters some sites or businesses basing their decisions on the spam score. The filter isn’t working real time. An update was noticed some time during the beginning of July which made business listings shrink a lot in local results. It was since then that the results didn’t update much until 1st There were no new businesses which were included and not a single one was eliminated from the current list. This clearly implies that Google re-runs the filter in definite cycles. This filter is specifically affecting few industries, way more than the other industries. There are certain industries where it seems as if the filter doesn’t exist whereas there are some other industries where there are too many listings which are getting filtered everyday. Age of listing, organic ranking, and duplicate listings are some of the factors on which Google bases its filter. On the other hand, the name of business has got nothing to do with your business listing being filtered in local search engine results. Therefore, get the facts clear before coming to conclusions about the fate of your site.